A reliable source for Poster Tubes information and a resource for accessing leading Poster Tubes and suppliers. Poster tubes are a type of mailing or shipping tube that are used to safely transport roll-able, unframed art that cannot be folded. They may also carry items like blueprints, large papers, signs, banners and important documents that must remain uncreased. They provide adequate protection against denting, dropping, crushing and bending that may occur because of rough handling during transit. Poster Tubes Poster tubes are a type of mailing or shipping tube that are used to safely transport roll-able, unframed art that cannot be folded. They may also carry items like blueprints, large papers, signs, banners and important documents that must remain uncreased. These tubes are made from wood pulp fibers and are cylindrical in shape. The cardboard material is composed of several layers that are cut into ribbons, coated with adhesive or fibers for reinforcement and wrapped around a mandrel in the desired shape of the tube at a continuous angle. Poster Tubes - Marshall Paper Tube Co., Inc. The long paper tube is then cut to size. Poster tubes protect fragile paper products better than cardboard boxes not only because of their round shape, but they also have dense, thick walls that provide more strength. It's important to choose the right size of tube. A large tube may damage the product because it might slide back and fourth. If it is too small, there may not be enough room for the poster and a cap or folded end. Optimally, the tube should be slightly longer than the rolled item. The ends are plugged by caps that are snapped on or glued and made of plastic, metal or wood. The ends might also be crimped and glued together. 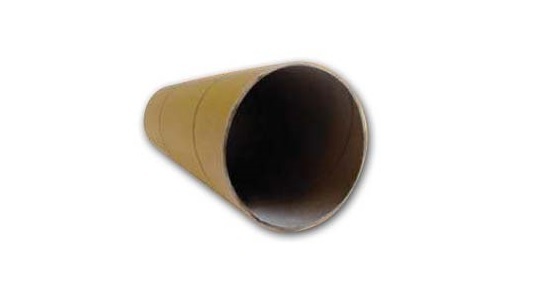 Some poster tube exteriors are covered in kraft paper to provide a nice finish, colors, text designs or images. Some more expensive poster tubes are waterproof and covered in a polyester canvas. They often have zippers, shoulder straps and compartments. These are not used for mailing, but rather personal transport.